Location: Main Index » Forum Index » Trucks-Vans-SUV » 88-98 Fullsize Trucks, Vans, Suburbans, Blazers, Tahoes » K2500 Lowering? Has anyone lowered one of these trucks without severely altering load capacity, or making a science project out of it? I just need a couple inches for ease of entry/exit, but don't want to hamper it's designed use(bad back). If you're only looking for a couple inches, Probably just uncrank the torsion bars, and maybe use drop shackles in the rear? I've never done it, and I'm not really a "lowered" truck person. Lowering 4x4s is done, but not super common. Edited by 454cid on 02-01-19 04:36 PM. Reason for edit: No reason given. Is there any lift blocks between the axle and leaf springs in the back? There is a big difference in 2wd and 4wd suspension. Richard will chime in and tell you everything you need to know about lowering a 2wd. Would smaller tires get it low enough? If your due for new tires, switching from 265/75/16's to 225/75/16's would drop you about 1" (speedo would need to be re-calibrated). 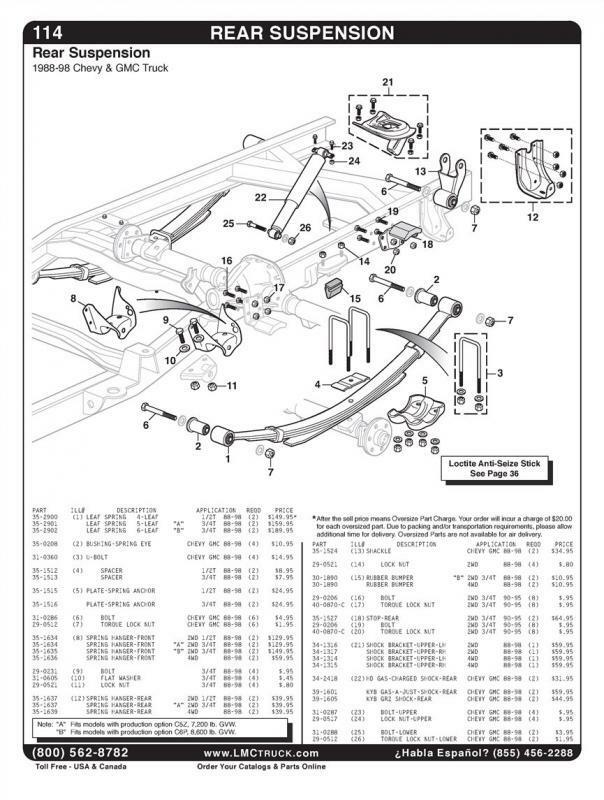 As mentioned, the front torsion bars can be adjusted, but too much and you may not like the ride. As for the rear, the leafs front mount is different on the 2wd models. I know the 1500 series frame gets it's increased height for the 4wd by using longer front brackets. The old 73-87 series did the same too. No doubt the 2500 frame is the same. It is a bit of a pain getting the rivets off though. See item 8 in the picture. I'm guessing we're talking a bout a 4x4...OP posted K2500. But yes, maybe some drop shackles for the rear and a few turns of the T bar to get it a bit lower..? Yep, sounds like the solution for a mild drop. The problem most seem to run into when lowering a 4x4 more than just a little bit is it puts the CV joints at an extreme angle and wears them out quickly. Shouldn't be a major issue with just an inch or two. Well, darn. I was really hoping there'd have been someone to offer up some application-specific or aftermarket shackle and/or bracket PN's from experience. If you're just looking for a couple inch drop, about the only thing you need to buy are some drop shackles for the rear. Just look 'em up based on your year/model as they are a fairly generic part. The 2WD pieces will fit your truck and cost about $50 for the pair. For the front, de-cranking the torsion bars will be OK for a mild drop. If you crank them down too far your ride quality will suffer. I think they are almost all the way down from the factory. A lot of people tighten them up to level it out which really does hurt the ride quality. "Leveling keys" or "lift keys" are even worse. Do they make a drop knuckle or spindle (whichever you like to callit) for a 4wd? Ugh...are you 100% sure? Idid not know that. On some other torsion bar applications I know you can crank 'em down to lower, like my old '61 Apache.. I do know a GMT400 4x4 can be lowered as I have a friend that did it, and he went WAY down with it, suffering CV angle problems in the process. I don't recall him buying any parts to do the job with so I was under the impression he just cranked the bars down. I think if you go too low, you end up hitting the rubber bump stops with the lower control arms. I have no idea how many inches you could go before that happened. I suppose you could trim the bump stops or replace with urethane, but I'd want to be checking out CV axle angles like you mentioned earlier. Where any of those drop spindles 8-lug, or just 6? Usually the dropped 4x4 guys (that's I've noticed) are Tahoes which of course are 6-lug. I think If I wanted to drop a 4x4 a few inches, I'd look into shorter tire, as a possibility too. Honestly, I have no idea what's available, Though. Well, all of the GMT400 and 800s I have looked at had way more up than they did down. Some of them were new and I know nobody had adjusted them. They had about 2 inches of bolt sticking out to adjust up,but only around 1/2 inch of bolt to go down. Those measurements are just estimates from the best I can remember. I think your friend had to have had other parts. It would be nice to know for sure. When I bought my truck, the bolts were all the way down. Someone had definitely lowered the front of it. The axles were actually closer to level which should put less strain on the CVs. I had friends that cranked the torsion bars all the way up. The CV angles were pretty steep and the ride definitely suffered.